Sao Paulo: Corinthians in trouble over new stadium? One of Brazil’s most popular football clubs is reportedly in a financial crisis after huge problems with the long-awaited Arena Corinthians. Construction won’t end until next month. Corinthians were among the first clubs to start planning a stadium of their own. However, it wasn’t until the 2014 World Cup preparations that they managed to make the dream come true. And along passing time, that dream started resembling a nightmare: cost inflation, delayed public support, overdue construction and growing debt became a major burden. According to Brasil 247, Corinthians owe a total of roughly 1 billion reais (€310m / $350m) to Odebrecht, general contractor of their new arena. The club was to receive a development incentive from the Sao Paulo prefecture to relieve construction cost, but still wasn’t paid the entire sum of R$ 350 million. Similarly, the Brazilian Development Bank BNDES delayed the release of preferential loan, forcing Corinthians to use commercial loans with high rates. Overdue payments and delaying construction also caused tensions between Corinthians and Odebrecht. The club commissioned an independent audit of Odebrechts work and found the company sometimes used cheaper materials and carried out cheaper work than indicated. The other way, Odebrecht reportedly accused Corinthians of insufficient commercialization of the stadium. Naming rights are yet to be sold and not all skyboxes were leased. 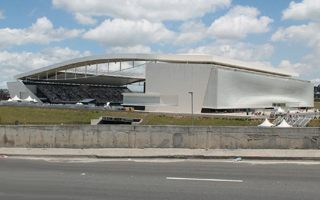 The club suggested it may be because of overdue construction works (set to end in April 2015), while Odebrecht replied rival club Palmeiras did much better despite commercializing a construction site. The number of underlying issues is high and some of the above information is based on unofficial reports, but one thing is certain: Arena Corinthians proved to be a huge burden, which destabilizes the club’s finances. Some sources even speculate whether Corinthians will be able to maintain their youth training programs. Certainly not the kind of issues the White-Blacks would want to worry about.